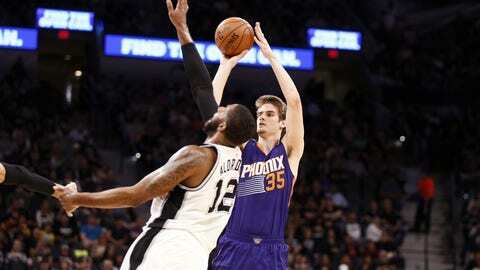 Phoenix Suns’ rookie, Dragan Bender, will undergo season ending surgery on his ankle. According to sources, the Suns are about to lose their fourth pick in the 2016 draft, Dragan Bender, for the season after he undergoes ankle surgery today. After missing seven of the Suns’ last eight games, Bender has officially been ruled out for the remainder of the season following ankle surgery he will undergo today. As the last team in the Western Conference, the loss to Bender won’t be a make or break move for Phoenix. For a team full of young talent, losing one of the future playmakers will hurt their development as a team moving forward. Suns rookie Dragan Bender is done for the season, according to Croatian journalist Bernard Jurišić. Bender was averaging just 3.2 points and 2.2 rebounds per game for the Suns through 38 games. Shooting just 37.1 percent from the field during his rookie season and averaging 12.7 minutes per contest. With the mid-way point in the season fast approaching, the Suns have rumors flying everywhere. From DeMarcus Cousins trade rumors to Alex Len’s dropping minutes, Phoenix is the hub of the rumor mill as of lately. For a team who is in the rebuilding stage, it’s no surprise that they are looking for changes. Right now, the Suns may be last in the conference, but they have a lot of hope. Their young stars are some of the best in the league, and losing Bender is a major blow to their growth together. This injury could be a major setback for Bender moving forward. As a prime candidate for the Suns’ power forward position next season, Bender needed a lot more development before he could take the reigns. Using a rebuilding year for the Suns to build his physical attributes and develop as an NBA player was crucial for his future career. Now, Bender will be forced to put in extra work this offseason to catch up with the rest of the Suns’ squad. Barring no setbacks, he should still be in the mix to be one of Phoenix’s top performers in the upcoming years. The Suns take on the Memphis Grizzlies tonight at FedEx Forum at 5:00pm PT.